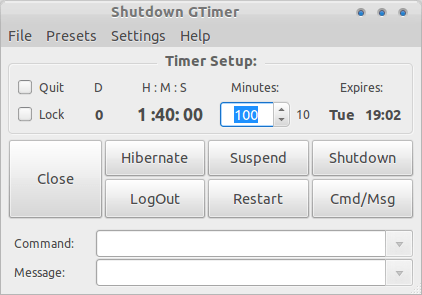 Shutdown GTimer is a simple shutdown timer with a simple user interface written in Python and GTK+. The main function of the application is Shutdown GTimer can schedule shutdown, suspend, hibernation, restart, log out, and execute shell commands, or just show a message. All settings can be stored into presets for future use.